Remember Ruth? Yesterday I carried out an online style analysis of her figure. Here I will use the analysis to provide advice to Ruth on what will be her best looks. Here is Ruth in some outfits she made recently. Ruth has a semi-shaped body so looks best in semi-fitted styles. The two outfits (above) would classify as semi-fitted. Her best look is to create a slight waist emphasis, following her natural curves. This would include softly shaped shoulders (no heavy padding). Ruth will suit styles in fluid fabrics (Ruth likes working with jersey). Lots of styles suit her but it would be good to avoid the extremes – neither a boxy outline nor a very fitted curved shape. I haven’t checked Ruth’s colouring specifically but I think this red and navy outfit is great in terms of both colour and shape. As Ruth has fairly broad shoulders I would suggest lines or detail at the CF. The long beads she has on in the first picture works well. A deep V is good, and the two necklines above serve to elongate the neck. But because Ruth doesn’t have a big bust she should avoid a very deep V or too clingy a top. A classic shirt in a soft fabric should work well if she leaves the top buttons undone. Ruth likes cowl tops, and they too suit her body type. She can also create a nice effect with a soft scarf or bow at the neck. Ruth is relatively short-waisted, with much of her height coming from her long legs. Therefore keeping the hems of her tops at hip level (and not tucked in) is good as this has the effect of elongating the upper body. Low slung wider belts and medium width belts (around 2″) in the same colour as the top will have a similar effect. Choose a buckle that has some character to add interest. In fact belts are a good look for Ruth, especially with a more formal look when she should always wear a belt with her skirt or trousers. Currently Ruth is carrying some weight on her hips so I suggest skirts with gores like the one above, but with the centre panel narrower than the outer gores, straight cut fuller trousers – as above – softly pleated skirts, and generously cut shorts. Because Ruth’s legs are long she can afford to wear a dropped yoke on her trousers, or turn ups if she pleases. Overall her shapely bottom and longer legs means that trousers should always be a first choice for her. Longer skirts (calf length) are an OK look, given Ruth’s proportions. However I feel she is hiding her legs which is a shame. Also I find this length somewhat dated and a bit too prim for Ruth who is essentially a young woman. Because Ruth is relatively long in the thigh she could wear a skirt that finished mid-thigh and still look good. I would like to suggest she experiments with shorter skirts, 4-6″ above the knee, wearing them with darker tights and shoes. If this works she might try a shorter skirt, culottes or full shorts over thicker tights, or with a nice pair of flattish boots. Ruth needs to make sure her skirts and trousers fit well at her back waist line, doing a sway back adjustment as necessary. I would suggest making apeplum style jacket that actually emphasises her neat back waist. Vogue 1132 is nice, but probably in a plain fabric. Using plaid that doesn’t match is just horrible, in my view. Worn with a slimmish (hip skimming) skirt, or well fitted trousers I think Ruth would look both professional and stylish for work or social events. In terms of the length of her jackets and coats avoid cropped and waist length jackets and make them hip bone length. Ruth can certainly wear longer jackets too, but they must have some shaping to avoid the boxy look. Ruth can wear most sleeve lengths including sleeveless. I would avoid fullness at the wrist – a tapered cuff would be neater, but ending the sleeve at the elbow will emphasise the waist. Like Michelle Obama show off your nice wrists and hands with shorter, smartly cuffed sleeves. In terms of scale as Ruth is medium (overall) she should avoid ditsy prints, and big patterns, and stick to a medium scale with everything from bags, belts, buttons, lapels, stripes etc. Ruth has a roundish face with lots of curves. Ruth would do well to choose a hairstyle that works with the planes of her face. The hairstyle should be soft and provide balance. I would think a side parting, rather than a straight fringe, some length at the sides (Look A) rather than clipped back would be a good choice. You can probably see in the two pictures that Ruth’s face looks more oval in Look A, and more rounded in Look B and in the photo with the red jacket. As Ruth has naturally wavy hair a softly layered cut or style that allows the curl to be expressed would be best. It may be worth trying a soft “up-do” to add height. Ruth could choose jewellery – such as earrings, brooches and pendants – with curved lines that will flatter her face. Similarly patterns Ruth chooses are best if they are curved shapes like the leaf print she is wearing above. Ruth should choose spectacles that give some definition to the cheekbones and draw the eye upwards to make her face appear longer, with the emphasis at the temples. Avoid very round or very square frames. They shouldn’t be too heavy, but not too delicate either, and in a colour that suits her natural palette. Fairly structured medium-sized handbags are good. Ruth prefers a flat shoe that she can walk in, and wears boots quite often. I think that boots are a good look, but keep them fairly streamlined. Also I really like the pointed “kitten” heel Ruth is wearing in the second picture. This sort of look is good for more dressy occasions and summer looks. Unfortunately Ruth has some foot problems which means she is not comfortable in court shoes . However comfy sandals with a high up strap will shorten the leg and may look a bit frumpy. Perhaps Ruth could try some more modern styles such as brogues or loafers in her darkest neutral, with darker tights. 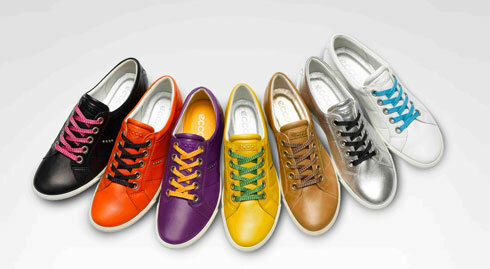 She might also try cool trainers with jeans – perhaps in an interesting colour, or a leather pair. Comfortable and fashionable. I hope this may be of use to Ruth, and possibly to others. Great advice, I’m sure Ruth will find it very useful ! Well done Kate. Quite comprehensive advice and very interesting to read, K. It will be neat to see Ruth’s experiments on Artisans’ Square. This is marvelous! I can see that such information would help to get a pattern adjusted right at the beginning….and knowing which styles to avoid would be such a time (and $$$) saver.